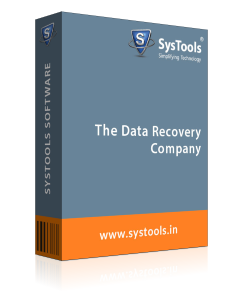 SQL Bak file Recovery Software is develop to Recover & Export Corrupt or damaged SQL data Backup File (.bak) into SQL Server. 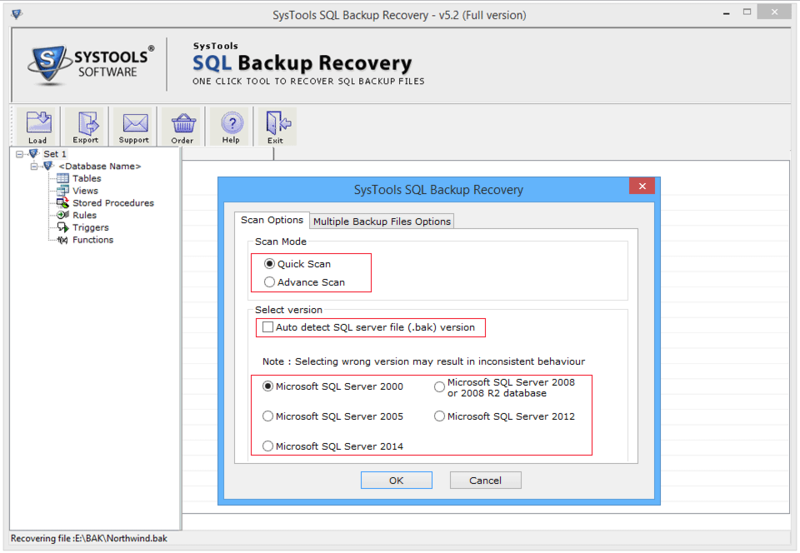 The SQL Backup Restore tool has variety of features, which makes the recovery of SQL data effortless and quick. Users can restore MDF and NDF files as well with this tool. 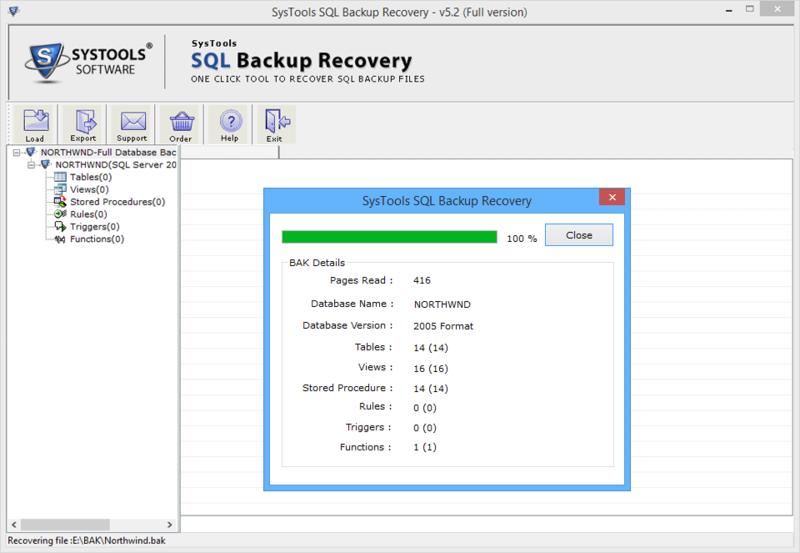 SQL Backup(.bak) file Recovery Software allows users to regain entire data from various SQL data backup file. The Components that are recovered includes: store procedures, Tables, rules, keys, triggers, views, functions, columns, etc. User can also preview the restored data within these components with the help of in-built viewer of the utility. It is possible that SQL server backup file contain other database files of SQL Server, such as MDF and LDF, which is a log file. During recovery of SQL .bak file, the SQL Server .bak file repair tool will recover all the files placed in the backup such as MDF and LDF file. With Only Schema: This will only generate the schema of table, views or procedures. With Schema & Data: Export both schema as well as data of the Chosen table views & procedures. You can check the triggers, procedures tables, or views and export only desired items. 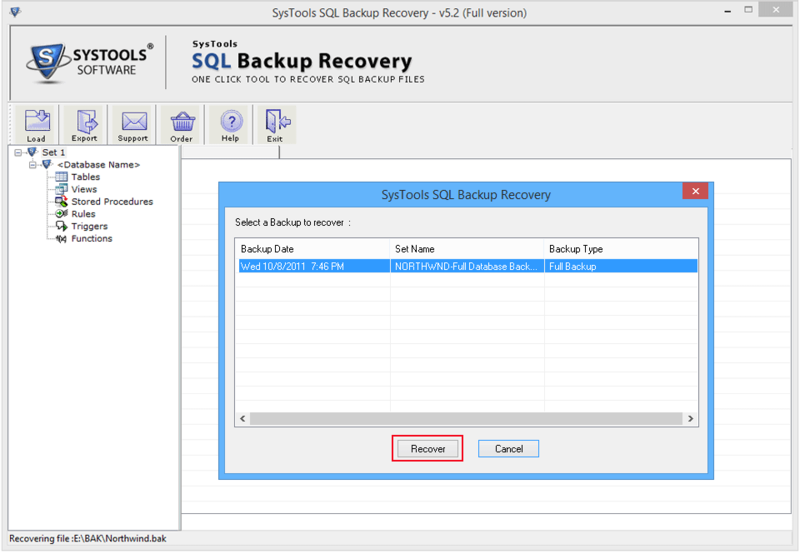 SQL server backup restore tool allows performing batch export of data from SQL data backup file to the desirable format. SQL Server Compatible SQL scripts: You can create an SQL script file and store that file on SQL server. SQL Server Database: You can export the whole data directly into SQL Server database by providing the complete credential of SQL Server account. No, this software is Windows based application. 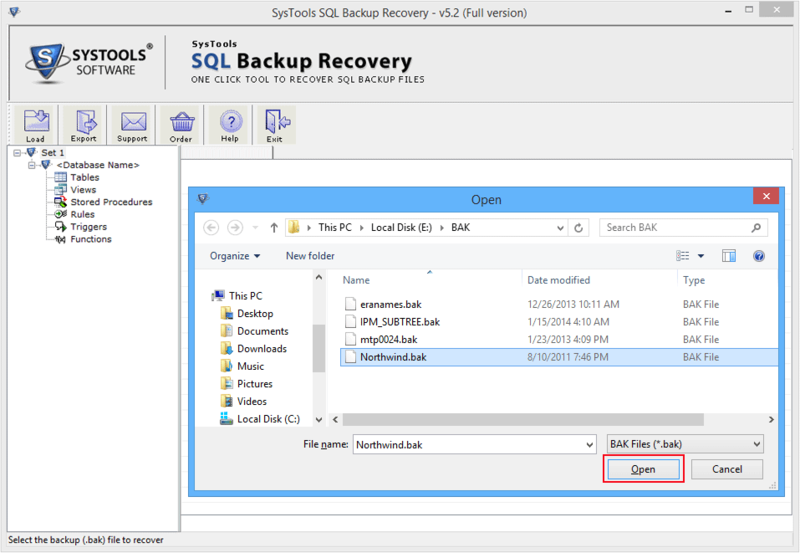 Yes, absolutely you can repair Corrupted SQL BAK files using SQL Backup file Recover utility. No, it is not mandatory to install SQL Server to recover BAK files. How to Restore SQL Backup file? Step 2 : Next, click on "Load.” This will initialize the Backup SQL file scanning process. Then, provide the backup file location and click Open to proceed further. Choose desired SQL Server multiple backup (.bak) files. Step 8 : Now, the scanning process will start and you can see many details like database name, Tables, Views, etc. Step 9 : Once the process is complete, software provide preview of all restored elements. Step 12 : Put in the credentials if you want to exporting directly to a live SQL Server Database. Save with Schema & Data: Option that lets you to save schemas along with data for the table. 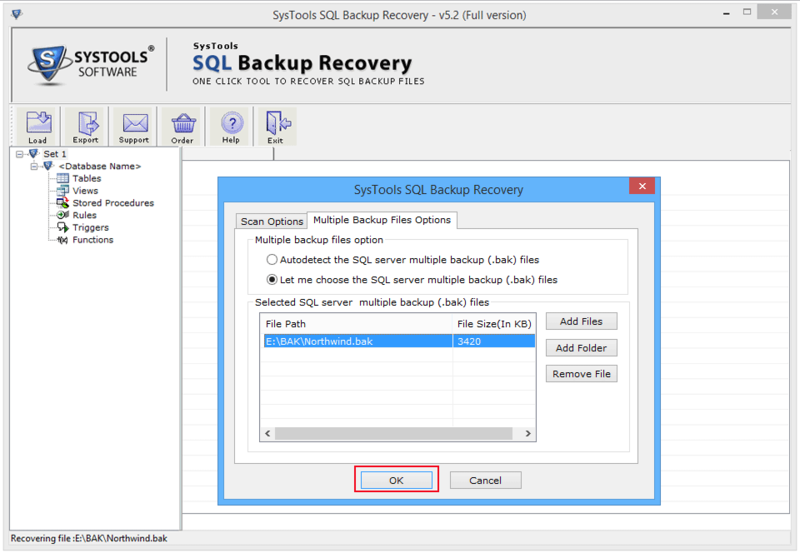 If I say that SQL Backup Restore Software is one of the best solutions to recover backup SQL Server files, then it would not be wrong. I was very confused about how to recover SQL Backup files. 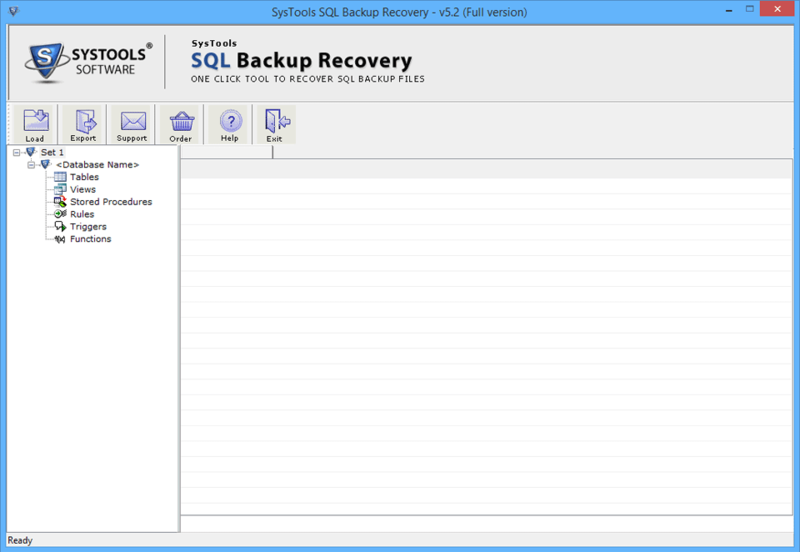 Fortunately, I came across with this utility and repaired all my SQL server backup files. It is really wonderful software.! SQL backup restore software is incredible software. 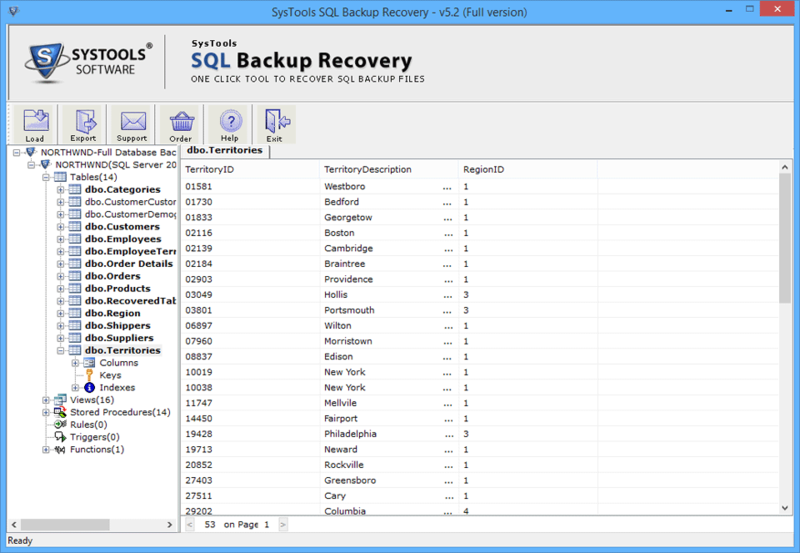 I have used the software quite often to repair SQL database backup files. It comes up so many unique and essential features and makes t very easy for the users to perform the task. I want to say a big thank to the developers of such a useful utility.